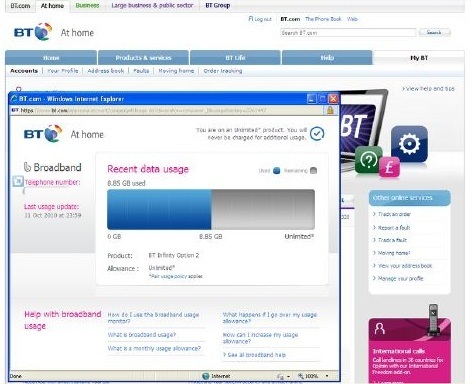 Complaints are flooding in about BT broadband monthly allowance usage charge. Depending on your package (if you have unlimited broadband you will be fine) you will be charged a fee of £5 for every 5gb of usage that you exceed you allowance. Here’s a recent complaint about this. Please leave a comment below this complaint if you feel these broadband usage charges are unfair or any other experiences you have had with broadband usage fees. I have just received notification that I will be charged £5.00 for exceeding my monthly bandwidth usage by 3GB. Having been a loyal BT customer for over eight years, this is the first time, maybe second time, that I have exceeded my allowance by a couple of GB’s. Fair enough, I understand that exceeding your bandwidth policy will incur extra charges, I also understand that, this is to prevent customers using excessive bandwidth which they have not paid for. However, there are many hundreds of times where I have not used up my monthly allowance. Are you willing to reimburse me for the many hundreds of Gigabytes that remain unused? I think not! In my opinion, this is penny pinching on your part; it is not the way to treat your loyal customers, and when my contract with you expires later this year, I am seriously considering moving to another ISP. I have gone over my broadband allowance for 8 months but BT have never notified me so i have paid £500 on to of my normal bill, I'm completely gutted we are a large family and this has hit us hard, we chose not to have paper billing so did not see the bills mounting and the email that i should have received from bt to say we had reached our limit did not have my correct email address on it so i was not aware of the direct debts that they were taking until i started running short of money in my account, I have spoken to someone from BT today and he said it was all my fault as the incorrect email address was on the account! strange as i have been receiving emails from bt for all other correspondence but thy said the . was missing from my address when i set up the broadband , so i have decided to end my contract close the phone line and the kids will now have to go round friends to go on the internet as we have had enough, it would not have been so bad if bt had met my half way with some of the £500 but it fell on deaf ears, sad as i have been a loyal customer for 25 years, well you learn the hard way sometimes .just another example of how easy it is to lose a large sum of money by a . going missing from a email address. I telephoned the technical department and spent a long time discussing my usage with a helpful gentleman who at least tried to be helpful. He said that perhaps the application I use to download movies could be still running after the downloads had completed. Obviously I wouldn’t know that without checking. He agreed that the usual updates which download automatically would only account for a few megabyte each and even if this habppened on a daily basis on several computers, they would only amout to megabytes and not Gigabytes, which is a huge difference. Before joining BT I was with another provider for my broadband and to reach 40 GB I would have to be downloading movies every day. In fact, my limit was 20 GB and I never exceeded it once in several years, and I have downloaded far less these past couple of months because I was making allowance for the drop to a 10 GB limit. OLD COMPUTER…31 days up to 15th February 2010. NEW COMPUTER…..from 15th February 2012 up to today (27th). It should also be noted that I have a settings cap of 20 GB, so it would stop downloading at that point anyway. When this application is open, but not actually downloading it does update causing a very slow trickle of up/down loading. On a 1 hour test it downloaded slightly less than 1MB, and uploaded a little over 0.5 MB, but since I always close it down when I’m not downloading this is insignificant. There are 3 other computers in the house but none of those are used for major downloads, quite simply thay have very little RAM and not enough disk space to handle downloads. Since receiving the bill my only downloads have been those required to manage my BT connection and since the upgrade I have downloaded the security program provided by BT. The computers are mainly used for social networking and playing a couple of facebook based games, all of which I discussed with your salesperson before signing up to the package. According to your billing department I now have a £40 excess use charge for January, and am set for another of the same ,OR MORE for February. In the meantime I have now upgraded to avoid any further excess charges and in anticipation of an amicable resolution once you have read this letter and looked in to things. As I mentioned at the beginning of this letter, there are three points of complaint. 1. I was talked into an inadequate package (although I fail to see where you are getting the figures from anyway). 2. Although warned of the excess and offered a way of avoiding the charges, this was not done by post and I never saw the warning until it was far too late. 3. All my evidence at hand, and based on past usage, I have not used what you say I have. Please treat this as a matter of urgency, although I’m not happy with how things have worked out, and the so caled better deal I was offered has turned out to be a far worse deal, I would actually prefer to stay with a more well known company like BT. I also posted my complaint on a BT forum and a technician at BT offered to take things on board. He asked me for certain information on a few occasions and I gave it to him. We were working together amicably. Then I received an email from BT stating that a broadband technician would visit my home to help, and that I could cancel the visit up till 2pm of the day before the visit date. Only problem with that is they neglected to include the visit date. I replied to the email accordingly but it turned out to be a "no reply" email, so I had to send a further email to customer services who replied that they would pass the message on, and that was the last I heard of that. As previously stated, I beleive the £40 charge is incorrect, so I payed the bill minus the £40 pending further investigation, and I contacted BT and told them why I was doing so. Meanwhile I had already made arrangements to switch to another provider should not take this seriously. Today (6th March) is the last day for me to cancel the move. I received an email this morning from the helpful technician asking for more information. Before I had chance to reply a BT letter arrived in the post. They were asking for immediate payment of the £40 charge and full payment of the next bill, which wasn't due until 8th March. It also stated that if this wasn't paid immediately they may restrict my service. The letter was hand signed by the Director of customer services, Warren Buckley, and dated 1st March 2012. Needless to say I will not be cancelling the switch to another provider, so I look forward to more letters from BT demanding the above amount and the £139 charge for breach of contract they also said I would get if I moved provider. I dont think the "B" in "BT" stands for British any more. I was assured when taking my package out that I wouldnt reach my limit even when I explained to them what I use the internet for (online gaming, watching movies online, speaking on Skype and work). Several times I have came very close to going over my limit which wasnt explained to me when taking out the package that charges apply at that rate. Customer service (or lack of it) is extremely bad! Every call takes me 30 minutes plus and I never get my problem resolved. We joined BT broadband from Orange (where I had unlimited Broadband usage and never any problems) a few months ago to try and save some money. So far I have been charged twice for exceeding the broadband useage allowance of 10GB by 2-5 GB. I think this limit is very poor and too low and a way for BT to recuperate some of their advertising costs. I think the usage allowance wasn't very well explained to me and wasn't prominant in their advertising. I am regretting my decision to switch and once my tie in period is up I will either switch back to Orange or another provider. Yours A dissapointed BT customer. i have been having problems with BT since december. my hub is down more that it is working, but still seem to go over usage allowance. how can this be right i would like a refund for all the times i have under used allowance. we are not doing anything different but we have now been charged £25 in march and £5 for may yet in may we had no internet for a week. that another issue which i will not start but i know the que cards word for word for the indian call center reset what lights are on is it pluged in the middle bottom middle top what hub is it ect ect. bt need to sort or as of august we are changing. BT is now so totally incompetent, they cannot realistically survive in a competetive commercial market for much longer. ON recvently switching to Sky, I got a call from BT trying to get me to stay. "How much as you payijng with Sky?" they asked. "£10 per month, free for 6 months" I replied. "Sorry – we can't match that". If you can't compete – get out of the market – or you customers will eventually put you out of the market. I complained to BT about three successive months of incurring extra Broadband charges when I had never previously exceeded my limit. Since my complaint, usage has returned to the lower levels I previously experienced! What are BT up to?